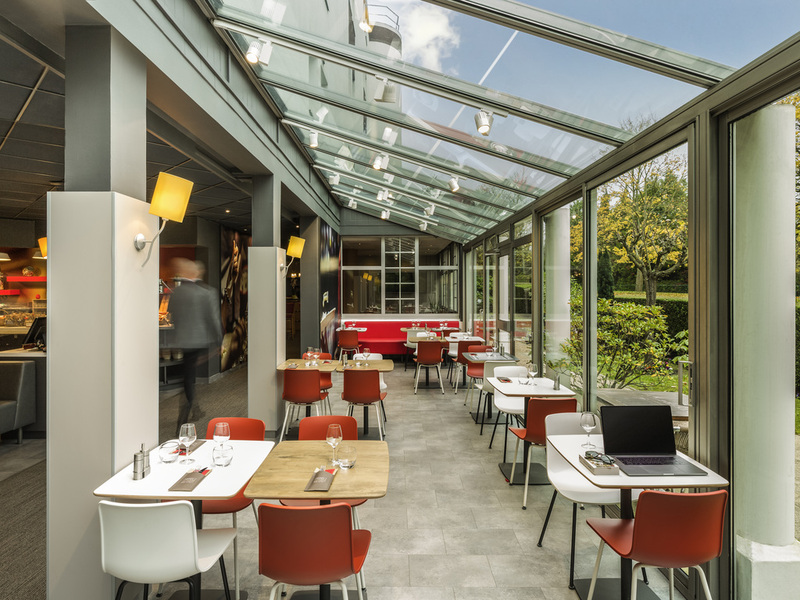 At the edge of the forest, close to the N118, the ibis Paris Meudon Vélizy hotel is located on the Vélizy Inovel Parc business park. It is 6.2 mi (10 km) from the Porte de Versailles, 10 min from Pont de Sèvres metro station and close to many visitor attractions. The hotel has 94 air-conditioned rooms, an ibis Kitchen restaurant, a 24-hour bar and a meeting room. The hotel offers fiber-optic WIFI, a private covered car park with charging terminals for electric vehicles and a fully equipped fitness center. Located at the edge of the forest, 0.6 mi from Meudon observatory, 4.3 mi from the Palace of Versailles and 1.9 mi from Sèvres porcelain factory. Ideal for exploring Paris and the Palace of Versailles, and for evenings at La Seine Musicale in Boulogne. Canal + package of movies, series and sports. Equipped with the new Sweet Bed by ibis bedding, the practical and inviting ibis room has everything you need to enjoy your stay: air conditioning, a large cozy bed, desk, broadband, flat screen TV with beIN sports and a bathroom with toilet. Modern and friendly restaurant offering traditional French cuisine.